My second term here at Chung Dahm Peyongchon Branch is already two weeks underway. So far, “Track B” has proven to be much easier to prep for and teach, just as promised. I am only teaching three levels this term, which is so much more manageable than five. On Mondays, Tuesdays, Thursdays and Fridays, 4:00 pm class I teach Memory Tera. I am teaching Par Reading at 7:00 PM on Tuesdays and Wednesdays, and Birdie Reading Wednesdays at 4:00 and Thursdays at 7:00. I get off early on Monday and Friday nights, which I am loving. I also have my own classroom this term. My Wednesday 4:00 pm Birdie class is composed of elementary students. Because Birdie is a fairly high-level reading class, this means I have a class of very smart students. I really enjoy them and get to bring in extra information to challenge them. The first week we met, the students encountered two new terms; tangible and intangible. I explained that tangible is something you can touch or experience and intangible is something like an idea, something you cannot touch. They seemed satisfied with my explanation and we went on with the lesson. However, about thirty minutes later, one student (Jimmy) wondered if air is intangible; a pretty good question for a fifth grader I’d say. After a few minutes of discussing this rather complex idea, I think I convinced him that air is tangible because it can be experienced (we can feel it when we take in breath). Intangible things are more like beliefs and ideas, like love or whether we believe in God. He seemed satisfied once again. The experience made me realize that I will really have to bring my “A” game to Wednesday Birdie class, but I am so looking forward to the challenge. Folks at Chung Dahm call it a perfect storm when you have a higher level reading class filled with elementary aged students. Even with the new term proving to be so promising, I cannot help but miss my former students; even the ones who were difficult. Still, it’s fun to hear from other instructors that this or that student is in their class and how they are doing. It’s funny, it’s after you no longer have these students that you learn if they liked you or not. I hear it second-hand from my students’ new instructors that this or that student really likes me. It works the other way too; I hear from my students how much they liked (or sometimes, disliked) their former teachers. A majority of my students “leveled up” last term and the few that did not really could use another term at their current level. I took a few pictures on the last days of classes and will post them here (if I figure out how). This new camera of mine is very smart; it will sometimes ask if you want to keep the picture you just took if it detected that someone moved or blinked their eyes. Because of the nature of Korean eyes, my camera almost ALWAYS asks “did someone blink?” and I wonder if my camera is racist (or just made by wide-eyed westerners). This past week I made and put a construction-paper Christmas tree on my door and have had my students add decorations to it. The elementary aged students are eager to partake in coloring and adding things, though, so far the middle-school students have not contributed anything. 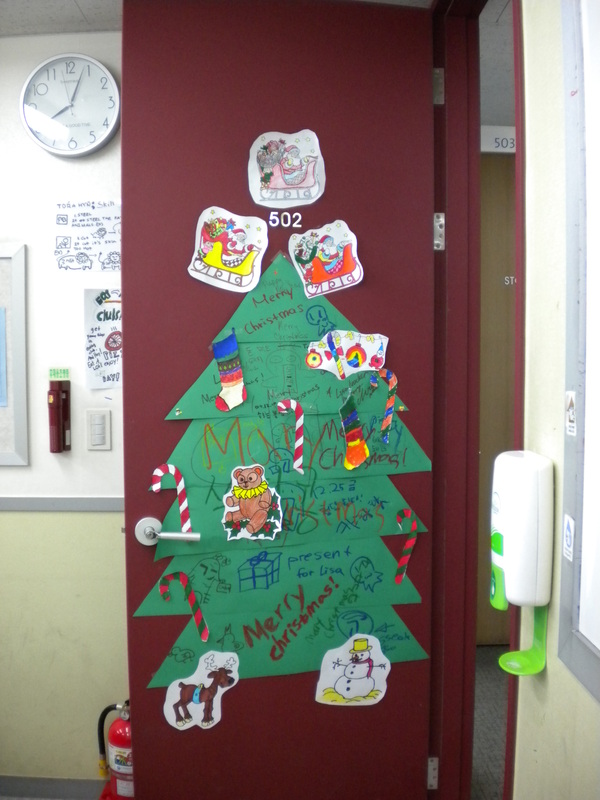 Our branch is sort of having a contest and other instructors are decorating their doors as well. So far there is a snowman with snow flakes on one door and student-drawn Christmas scenes on another. I was pleased when the Chung Dahm staff came to my room the other day and complimented my on my door. I can’t believe Christmas is less than two weeks away. Christmas in Korea will be something to remember, I’m sure. 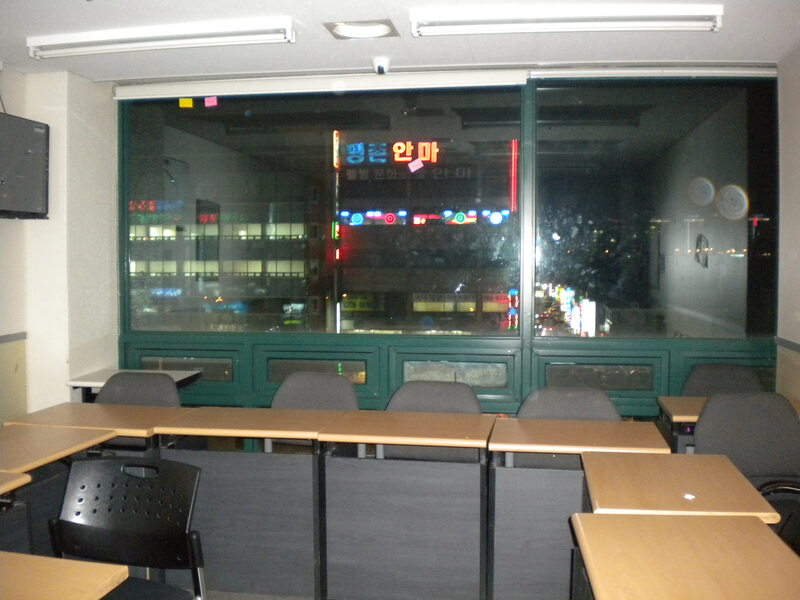 This entry was posted in Tales From South Korea and tagged Chung Dahm, Tales of South Korea, Teaching English as a Second Language, Teaching in South Korea on December 12, 2009 by Lisa M. Hase-Jackson.